What is happening in the conference and exhibitions. 6th annual Western Cape Smart Procurement World event brings together all SCM and procurement practitioners in the region. Alongside the conference is a showcase of leading solutions and products for the profession. Smart Procurement World is the ideal independent business-generating event! Part of the ultimate procurement and inbound supply chain conference and expo in Africa, the conference provides an opportunity for professional development and updates in supply chain management. The Harare Indaba focuses on investing in the resources and mining sector in Zimbabwe and at this time of pending renewal and rejuvenation in Zimbabwe the event addresses the areas such as How will the Zimbabwe economy and more specifically, mining industry, renew itself, What is changing in the country and what will this mean for the mining sector, What will it mean for investors, Mining’s contribution towards regenerating the economy of Zimbabwe, and much more. African Utility Week is an event promoting the development in African countries. The show is the one world assembly location, convention and trade exhibition for African vigour and water utility professionals and offers a distinct networking possibility for engineers, stakeholders and resolution vendors alike. This event shows products like discuss strategic and technical improvements in the utility power, water and gas sectors etc. in the Business Services, Power & Renewable Energy industries. The Facilities Management Expo is the trade expo for the Facilities Management industry: inspiration, education, innovation and it brings together all aspects of facilities management, providing a platform for knowledge exchange, relationship building, bringing exhibitors and visitors alike up-to-date with the latest trends, products, and legislation, face-to-face networking opportunities, and much more. Visit Securex South Africa 2019, celebrating its 26th year in 2019, for everything you need to know about security. Encompassing fire protection as well as both physical and cybersecurity, Securex 2019 will once again run alongside A-OSH EXPO, Africa’s leading occupational safety and health trade exhibition. It will also be co-located with a third expo for the very first time – Facilities Management Expo 2019, the show that brings together all aspects of facilities management. Power Gen Africa brings together international business leaders and technical experts committed to POWERING UP A CONTINENT and features a comprehensive conference programme and extensive exhibit floor. The event spans all aspects of centralized and distributed power generation along with leading technologies in power transmission and distribution and focus on various aspects of power needs, resources, and issues facing the electricity generation industries. The Western Cape Property Development Forum will cover areas like Learning from successfully completed developments, Highlighting potential development opportunities for local developers, Identifying practical solutions to alternative electricity sources. CIO Mining Africa Summit is an event for digital and IT sector companies. The event is expected to attract over 200 participants from over 20 countries. The event aims at uniting Minsters from Africas most established and emerging mining economies with global mining executives, investors and service providers to meet, share ideas, connect and encourage greater partnerships & stakeholder engagement. The conference will cover areas like Digital Transformation in Workforce management in mining, Reinventing IT to respond and adapt to the industry economic downturn demands on the IT function, IT spending during a slump, Creating and Sustaining an industry leading position through Effective IT Governance. The meqasa Home & Property Fair offers property seekers the opportunity to meet with the nation’s top real estate developers, home loan specialists and home improvement vendors to help them find their dream homes, office space and real estate related products and services. There will be various opportunities for attendees to meet new people and identify those leads that are specifically relevant to their businesses. The Nigeria Energy Forum set to upscale the development of sustainable energy services for all through a capacity building, training and development programme for policymakers, business leaders, energy innovators, professional engineers, industry experts and academics in Nigeria and other African countries. The East Africa Property Investment Summit is a leading property event for the entire region’s real estate market. Driven by passionate professionals, fast-growing economies and exciting projects, the real estate sector provides potential and opportunity for the educated and savvy investor or developer. The Kenya Homes Expo is the region’s biggest homes show. Targeting the entire African region with a major focus on East & Central Africa, the Kenya Homes Expo is an experiential platform that creates a level ground for real estate players to converge with a ready market for land, homes, financial advice and general real estate information. We are the heartbeat of East & Central Africa, the authoritative voice of the real estate market. Exhibitors ranging from landowners, realtors, contractors, landscape artists, to interior design companies and insurers and bankers, we successfully deliver eye-opening and innovative shows for the real estate industry. BotsReal Property & Infrastructure Forum will facilitate the platform for both private and public investors, developers and industry professionals, to network, debate and examine issues and opportunities around the countries property & infrastructure sectors. Through API Events’ regional network, the event will also attract international companies and investors looking for opportunities in Botswana as well as potential partners, suppliers and service providers. Mining Investment Conference & Exhibition Botswana is a strategic mining conference and exhibition for the leaders of the mining, quarrying and construction materials industries, bringing together attendees from countries. The Mining Investment West Africa is a strategic mining conference and exhibition for the leaders of the mining, quarrying and construction materials industries, bringing together attendees from countries. Ministers, mining companies, investors and service providers travel from all over Africa, Asia, North America, Europe and Middle East for two days of partnering, networking and business matching. Join us at an invaluable platform to seek new partnerships, new business and new opportunities. Join the region’s key procurement, supply chain and supplier development professionals as they embark on the impact of procurement. They will engage with top suppliers and corporate ready SMMEs over the conference day. Power & Electricity World Africa will play host to many visitor attractions, bringing to life the learning from the conference and seminars through a series of thought-provoking installations and live interactive launches, showcases and interviews, located within the exhibition floor. The Water Show Africa will play host to many visitor attractions, bringing to life the learning from the conference and seminars through a series of thought-provoking installations and live interactive launches, showcases and interviews, located within the exhibition floor. Part of the 22nd annual Power & Electricity World Africa show (Africa’s largest and longest-running power and electricity show), The Energy Efficiency Show Africa is Africa’s premier energy efficiency and lighting show. With increasing electricity prices and supply concerns, property owners, architects and large energy users, including mines, commercial property developers, industrial manufacturers and retailers are continuously looking to source cost-effective and sustainable energy efficient and lighting solutions. A travelling Mining & Industrial Exhibition that brings new products to market with resounding success, benefit from on-site sales, new sales leads and brand visibility. It delivers a great return on investment for exhibitors, with visitors keen to see the latest in products, services, technologies, and trends across the mining, construction, Industrial, power generation and machine tools sectors. “The biggest Student Accommodation Development and Investment Meeting in South Africa”. The Student Accommodation Development Summit, developed alongside industry experts on our advisory panel, will welcome senior government leaders, developers, investors and universities to discuss the future of student accommodation in South Africa. The summit seeks to address the huge backlog of student accommodation and funding in South Africa. There is growing pressure for government, private sector, universities and investors to look for more innovative solutions to address this challenge. Intouch Africa in partnership with the South African Property Investors Network (SAPN) and the Enterprise Development Property Fund will be hosting this high level information sharing meeting to unpack the current state of student accommodation in South Africa, and look at various global and local innovative methods to address this challenge, as well as setting a path for greater investment and partnership in student accommodation. The Mining Investment Nigeria is a strategic mining conference and exhibition for the leaders of the mining, quarrying and construction materials industries, bringing together so many attendees from many countries. Ministers, mining companies, investors and service providers travel from all over Africa, Europe, Asia, North America and the Middle East for two days of partnering, networking and business matching. BUILDEXPO Africa is the only show with the widest range of the latest technologies in construction machinery, building material machines, mining machines, construction vehicles and construction equipment. After 19 successful editions of BUILDEXPO in Kenya and Tanzania, East Africa’s largest building and construction fair, it had ventured into the Ethiopian market. The second edition of BUILDEXPO ETHIOPIA will provide an international business platform by enabling global investment opportunities. The Regional Energy Co-operation Summit: East will take place from 27-29 March 2019 in Addis Ababa, Ethiopia. The meeting will unite regional governments from Kenya, Uganda, Tanzania, Rwanda and Ethiopia, leading utility and regulatory companies from the region as well as international financiers, donor organisations, power developers to focus on what is needed to unlock investment in energy and infrastructure for regional growth and development. Co-locating with the 3rd Off the Grid Summit, the meeting’s agenda will provide networking opportunities and open discussions exploring practical solutions geared at increasing investor appetite in East Africa. 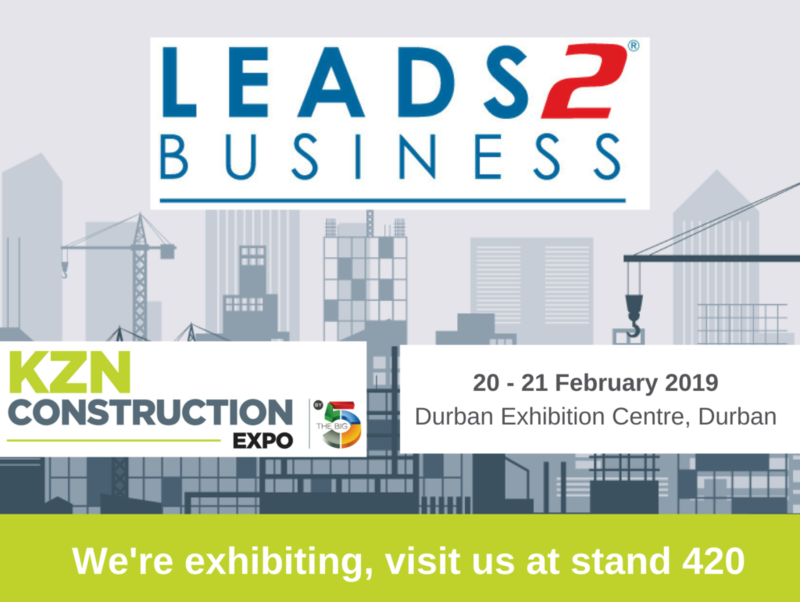 KZN Construction Expo 2019 is ‘KwaZulu-Natal’s must attend building and construction show’ and is taking place on 20 and 21 February 2019 at the Durban Exhibition Centre. Leads 2 Business will be exhibiting; check out our Exhibitor Page and Facebook Event. For more information see the detailed brochure below or to attend click here. Investing in African Mining Indaba gives an opportunity to meet with only investors, mining companies and other firms involved in the deal-making process like banks and brokers, all in one place. Apart from that, this is the only platform where mining company COOs and Project Directors discussed the latest disruptive tech and innovative investment strategies, It also has Panels and Workshops where key stakeholders came together to define a common vision for sustainable development in Africaâs mining industry. The CIO Power Africa Summit hosted by Vale Media Group, the number 1 Sub-Saharan African B2B events company, will bring together the senior IT decision makers from the IPP, PPP and national power communities across the region to focus on information technology within the power sector. CIO Power Summit is leading the way to the digital revolution within the African power sector and will cover all of the major topics that are hot in the industry right now. From analytics to IOT, connectivity to cyber security, the CIO Power Summit is the go-to event in Africa to keep up to date with digital transformation and a place for end users to meet with technology companies who are developing tomorrows technologies today. The Women in Energy Conference was designed to aid the increase in leadership and development of women involved in the African energy space. This one-day event provides a platform for women to network, share their knowledge, discuss achievements and encourage the advancement of women across all sectors of the energy industry. The Africa Gas Forum was created to ensure a balance between country-specific opportunities as well as common issues that affect the whole region such as exploration activity, licensing rounds, development plans and the move to gas, new tax regimes, regional infrastructure projects, pipelines, LNG terminals, security, local content initiatives, investment requirements and other key projects. Project Management Summit theme will be Projectification of South Africa: Building the capacity to lead and succeed. It will explore this topic through a variety of formats. Participants will join project management thought leaders in discussion and shape thinking on how project management can positively impact South Africa. Africa Energy Indaba brings together influencers from governments, utilities, industry and the energy business sector for a leading informative business conference and a ‘doing business’ exhibition in South Africa. KZN Construction Trade Expo taking place 20th February to 21st February 2019 at the Durban Exhibition Centre, Durban, South Africa. The expo will attract over 2000 visitors, with 80 companies in attendance. Check out Leads 2 Business Exhibitor Page and Facebook Event. The Independent Power Producers and Power Purchase Agreements Conference (IPP & PPA Conference) is relevant across the board to those involved or interested in IPPs, regardless of technology and country. There is huge international investor focus on African energy projects and the role of IPPs due to the power shortages and load shedding in the various regions. Back on the 20th & 21st February, The Business Show (Africa’s largest business expo, conference, and networking event for anyone starting or building a bigger business) is set to deliver a powerful lineup of seminars, masterclasses and exhibitors. Undoubtedly, this is an event that just can’t be missed. The Wood Conference will aim at a specialist audience from the fields of architecture, engineering, woodworkers, carpenters, planners, interior decorators, schools and their students as well as to investors and the public sector. The participants will not only be shown wooden construction solutions, but also architectural, settlement planning, technological and scientific background information. The MICA International Exhibition of Mines and Quarries focuses on bringing together the sector’s professionals and stakeholders, exchanging experiences, discussing the latest developments in the field and forming partnerships between exhibitors and foreign participants. The three-day event will bring together decision-makers and operators of the sector to accompany and encourage the development of the mining industry. The platform will bring together 250+ leading investors, developers, architects, cities & regional authorities, service providers, consultants, lawyers, GIS firms, and solution providers from across the globe to discuss the critical issues and innovations affecting the building materials. This unconventional conference is designed to improve facility operations and building material management across Egypt while addressing ways to overcome key challenges facing industry today. EBMS 2019 aims to promote a roadmap for future development to echo the evolution in the industry. The SIPIAU show is a meeting space with the future owners of housing or commercial premises owners and investors to exchange relational opportunities with the decision-makers of local authorities, funding institutions, engineering consulting firm. It allows exhibitors to present their products and services in order to give visitors the opportunity to discover real estate offers, urban redevelopment and concrete solutions to housing responding to their needs and preoccupation. Property and urban redevelopment developers, architects, banks, engineering consulting firm will be all present at the disposal of investors and potential buyers in optimal conditions. Bringing together 1000 stakeholders, including leading policymakers, utilities, local industry heavyweights and international technology experts plus a buzzing exhibition, there is simply no better place for you to connect with the industry. In partnership with The Regional Centre for Renewable Energy and Energy Efficiency (RCREEE) and The Green Economy Financing Facility (GEFF), our mission is to create a forum that is the industry meeting place. The Solar Show MENA is where industry professionals come and learn how to develop sustainable, clean and bankable world-class energy generation projects throughout the region. International Conference on Engineering, Architecture and Technology will cover many topics like Architecture education, Architecture and human behaviour, Eco-Cities, Design and Sustainability, Theories of design and architecture, Precedents in Architecture, Development of rural and desert regions, Development of tourism areas, Ecology and pollution, and Smart and Secured Communications and much more. The Africa New Energy is the biggest platform for business-critical networking, learning, and commercial growth is back, featuring even more industry decision-makers, high-level representations from government and private sector. The Mining Leaders Africa Summit provides the attendees with illustrations on the regulatory challenges in the mining industry in Africa. Africa’s most exclusive and interactive C-Level event. The summit will talk all things new and hot right now in the industry, covering key topics around Digital, Innovation, Cyber Security, HSE, Government and more. The International Conference on Concrete Repair, Rehabilitation and Retrofitting, organized by the University of Cape Town will take place from 19th November to 21st November 2018 at the UCT Graduate School of Business in Cape Town, South Africa. The conference will focus on themes like Concrete durability, Deterioration Science, Condition assessment, Materials technology, Concrete repair technology, Rehabilitation and maintenance, Retrofitting and strengthening, Performance and health monitoring, Education, research and specifications. The Southern African Energy Efficiency Convention is an important energy event of national scope for end-users and energy professionals in all areas of the energy field. It provides the attendees with the opportunity to fully assess the big picture and see exactly how all the economic and market forces, new technologies, regulatory developments and industry trends merge to shape the critical decisions on their organization’s energy and economic future. Africacom is a 3 day event which gathers together senior decision-makers from the entire digital ecosystem etc. in the Telecom Products & Equipment industry.